Not what is commonly portrayed but still a stunning work of Art…. I’m confused, is there a clear description of the actual setting arrangement of the Last Supper that is scripturally based? I clearly understand the shape of the table and why it is so arranged and what the Seder meal consisted of. Can you explain? first and foremost you must keep in mind that the last supper (passover meal) as you probably know since you mentioned the seder meal is of the Jewish tradition. Hence the position of Jesus is fixed. John’s, Peter and Judas’s position is more or less confirmed by scripture in the way they are presented by way of their conversations with each other. However I believe Peter’s seat would normally have been left empty I reckon because that seat was reserved for Elijah’s return. 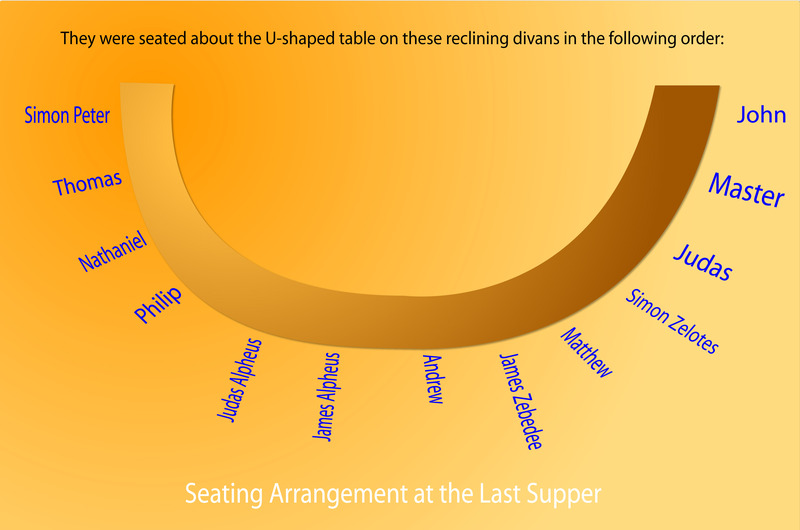 As for the rest of the seating arrangement for the remainder of the Apostles, I don’t think that really matters. Here are some links I found which will help you have a better idea…. Always wonderful to hear someone on a faith journey and reading the Word of God. Hope this helps…. Nathaniel in the New Testament was a good friend of the Apostle Philip’s and became one of Jesus’ Apostles later on. He is only seen with the name Nathaniel in the Gospel of John but in the Gospels of Matthew Mark and Luke, he is mentioned under the name of Bartholomew. He witnessed the majority of Jesus’ ministry along with his death and resurrection. James and Judas the sons of Alpheus, the twin fishermen living near Kheresa, were the ninth and tenth apostles. Jude for short is generally identified with Thaddeus, and is also variously called Jude of James, Jude Thaddaeus, Judas Thaddaeus or Lebbaeus. He is sometimes identified with Jude, “brother of Jesus”, but is clearly distinguished from Judas Iscariot, another disciple, the betrayer of Jesus. I didn’t know Mark wasn’t at the last meal. He wrote about it. Was it a recounting of the story from one who was there? Your material also doesn’t recognize Mark as an original disciple. I didn’t know that either. Can you add some more info? Thank you. Also, wby was Judas so close? He was given the seat of honour…. Jesus said, when asked by the mother of the two Zebedee brothers that they be given the most important seats (if facing the table the 1st seat on the left, and the seat of honour next to Jesus, which would have meant that they would be seated next to Jesus on either side, as their mother asked), trhat only the Father knows who will be sitting where, and that He Homself did not know. In order for Him to serve Judas with the bread, Judas had to be seated next to Him. The passage you are referring to points to the heavenly banquet in God’s Kingdom that is why the brothers and the mother did not and could not fully understand. Thank you for that great chart. Where were Luke, and Mark during the last supper. I thought they were there. Where were they? Does anyone know? Though u-shaped tables existed as well, so the single-table hypothesis remains a possibility. Having just been down the catacombs in Rome and seen 1st and 2nd century depictions of the last supper. All of them only show 7 people sat at the table but try find any information on only seven people sat round the table and its impossible. It seems that everyone has been suckered into leonardos last super and all the other Renaissance paintings. Not only that but the resurrection is depicted as Jonah and the sea monster (not whale which was also a revelation) why not show jesus being rising from the dead?? Well there is a lengthly account which may be food for thought….